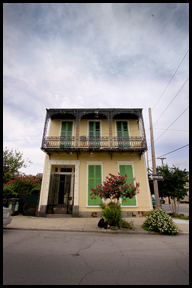 Maison Vitry | an ever-evolving, Creole home in New Orleans. Maison Vitry, located in the Treme neighborhood of New Orleans, is a creole mansion built for the free woman of color, Louise Arsene Vitry. Established in 1855, during New Orleans’ golden age, the home has been remarkably preserved in an elegant state of decay. The site is now an architectural gem and features 14 foot ceilings, original plaster moldings, mantles, and frescoes, a solid mahogany staircase, cast iron balconies, and marbelized base boards. Our site allows for an insider’s view of the home’s continuously evolving nature, events, decorative projects, and all the excitement that comes with living with such a home. The home is also quite popular for photographers and videographers, both of which can find useful information throughout this site. We hope you become part of the discussions, give your opinions, help with ideas, and get to know Maison Vitry.